Much of my professional life takes place in the collision zone between ecology and bureaucracy. These make uneasy partners: ecologists like to think of themselves as Lone Rangers riding out to put the world to rights rather than as small cogs in big administrative machines, but the reality is that environmental regulators need both “carrots” and “sticks”, and wielding the latter makes them part of the criminal justice system, with all the responsibilities – and paperwork – that that implies. I’ve spent quite a lot of time over the past few years working on developing standards for nutrients in freshwaters. Roughly speaking, I have been helping to define the freshwater equivalent of the 30 miles per hour speed limit. Speed limits work partly because everyone understands the dangers of driving too fast in urban areas, and partly because we know that there is a good chance of being caught by a speed camera if we drive too fast. And so it is (or should be) for pollutants: the lower dashed line on the graph of phosphorus in the Ouseburn in the previous post is the “30 mph” limit based on an understanding of how phosphorus interacts with freshwater ecology. There is a lot I could write about how these values are derived (a subject for another day) but that, in a nutshell, is what we are trying to achieve. When my students are analysing the data from the Ouseburn, they find standards for ammonia, BOD and phosphorus relatively easily via the UK TAG website but they come to me each year wondering why they cannot find equivalent values for nitrate. The UK TAG document says “we consider the general understanding of this [nitrogen] to be insufficient at present for it to be used as a basis for setting standards or conditions.” This was disingenuous in the extreme because I know that DEFRA has been extremely reluctant to set standards for nitrogen as this would focus attention on agricultural pollution which is both much harder to manage and would incur the ire of the farming lobby. A few years ago, Nigel Willby and I calculated the nitrogen concentrations that would support good status in UK rivers as a by-product of a project to revise phosphorus standards. We had the data we needed and it struck us that no-one would turn down our “buy one, get one free” initiative. Not so. Our figures for nitrogen were quietly excised from our report using the very good argument that it was going to be a hard enough job to argue the case for tighter phosphorus standards without confusing the issue with nitrogen too. Since then, little has happened, as far as I know, to push nitrogen up the regulatory agenda. 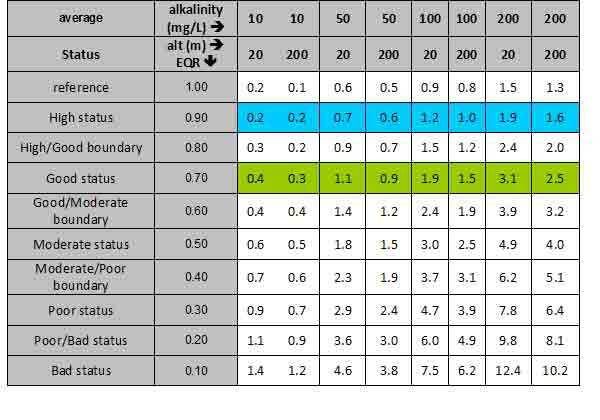 The table below shows these values simply to indicate the values of oxidised nitrogen (which is mostly as nitrate rather than nitrite) that are associated with different levels of ecological status in UK rivers. They have no regulatory significance, but should give us a rough idea of how much nitrogen is “too much” when we are trying to understand the ecology of a river. Predicted Total Oxidised Nitrogen (nitrate-N + nitrite-N) concentrations associated with EQR values modelled for two altitudes (20 and 200 m asl) and four alkalinities (10, 50, 100 and 200 mg L-1 CaCO3). Boundaries are normalised at 0.8 (high/good), 0.6 (good/moderate), 0.4 (moderate/poor) and 0.2 (poor/bad)); 0.7 and 0.9, therefore, represent conditions at the middle of their respective status classes. Applying these values to the Ouseburn, a lowland, hard water river, we see that most of the values lie below this threshold except for those from Woolsington, the headwater stretches which are surrounded by agricultural land where there is likely to be extensive use of artificial fertilisers. The open circles on the right of the graph are values collected by my students each autumn, which may explain why they are lower than the annual mean values that the closed circles to the left represent. But note, too, the high values in the Airport tributary in the early 1990s. These occur at about the same time as the high ammonium concentrations that I discussed in “Part of the problem?”. 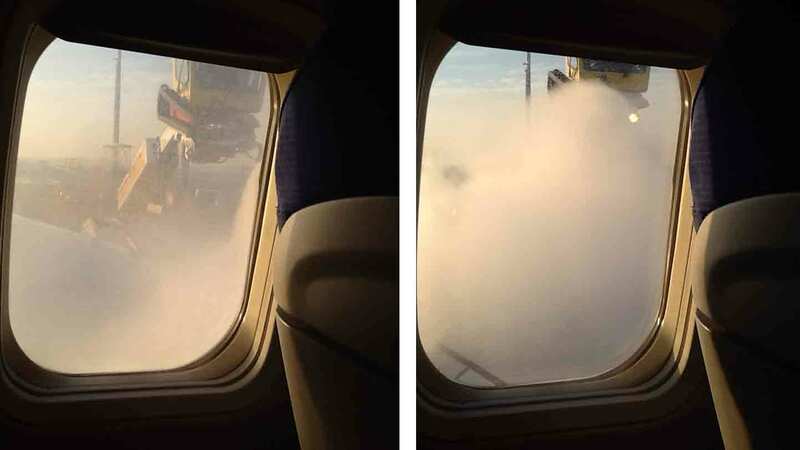 The ammonium that the airport released into the stream has a nitrogen atom bound to four hydrogen atoms using strong bonds. Some microorganisms are able to break these bonds and use the energy that is released to drive their own cells. This is what we see in Airport tributary where the high nitrate is the result of a two-step process that breaks down the ammonium first to nitrite and then to nitrate. Trends in concentrations of nitrogen as nitrate in the Ouseburn over time. Woolsington is upstream of the airport, Airport tributary (Abbotswood Burn) receives runoff from Newcastle Airport and Jesmond Dene is about 10 km downstream from the airport. Closed symbols are annual means of data collected by the National Rivers Authority and Environment Agency; open symbols are means of data collected and analysed by Newcastle University Geography students in October (once also in February) of each year. The dashed line is the modelled concentration above which the river is unlikely to support “good ecological status. The final graph shows concentrations of nitrogen as ammonium and nitrate at the three sites we’ve been examining, along with the (official) standard for nitrogen as ammonium plus my unofficial guide value for healthy nitrate-nitrogen concentrations. This gives us four quadrants, with bottom left representing situations where both forms of nitrogen are at concentrations that should not significantly impair ecology. This is the case at the two sites downstream from the airport from the mid-1990s onwards, once ammonia concentrations were under control. The top right quadrant, by contrast, has just a small number of values from Airport tributary from the early 1990s, when high ammonia was rapidly oxidised to yield high nitrate-nitrogen concentrations too. A further cluster of sites, mostly from Airport Tributary and Jesmond Dene, also have high ammonium concentrations, although nitrate-nitrogen concentrations are below the threshold. 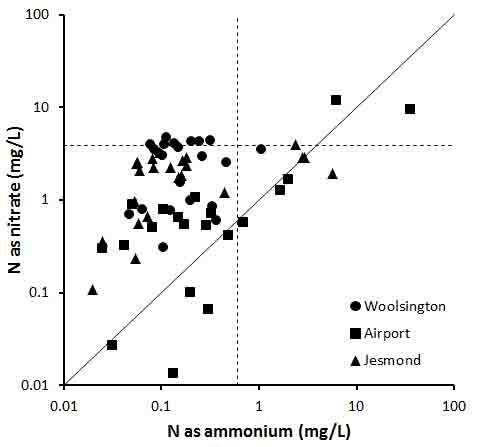 Finally, at the top left, we have values from Woolsington where concentrations of nitrogen as ammonium are low but nitrate-nitrogen concentrations may be a problem, due to agriculture. For a river that is less than 20 kilometres from source to mouth, there is a lot happening in the Ouseburn, which makes it ideal for students to become acquainted with the complexities of environmental regulation. You can read the history of pollution control in the graphs of data too: from intercepting toxic point sources in the 1980s to more general concerns about overflowing storm sewers in the 2000s and, now, more interest in diffuse nutrient pollution from farmland in the headwaters. That, too, is a good lesson for undergraduates: pollution, itself, is not an unambiguous concept and its definition has evolved as our understanding increases. One lesson that we can draw from this episode about nitrate standards is that the scientific argument about sensible levels of any pollutant can quickly become obscured by politics and vested interests. That can never be a good thing. Relationship between nitrogen as ammonium and as nitrate in the Ouseburn between 1989 and 2016. The diagonal line has slope = 1 and the horizontal and vertical dashed lines indicate the position of the maximum concentrations that are likely to support good ecological status. There is no differentiation between Environment Agency data and data collected by Newcastle University students on this graph. Newcastle Airport plays a big role in the story of the Ouseburn. It occupies quite a large site in the upper part of the catchment and has grown over the years from the humble structure which I remember from the 1980s to a major regional airport. The environmental impact increased as the airport grew in size, particularly in the winter as de-icer drained from the ‘planes, via a small tributary, into the Ouseburn. The graphs below illustrate this very well. The original de-icer was a mixture of urea and glycol. Urea breaks down rapidly to ammonia and, at its peak in 1993, the annual average concentration in this tributary was 35 milligrams – sixty times more than the current target for “good status”. Over six tonnes of urea could be applied in a single day at this time. 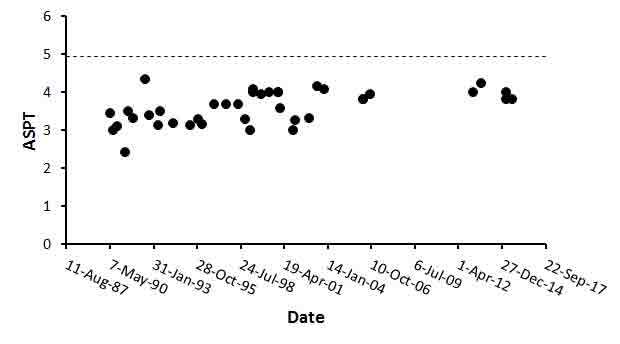 Trends in concentrations of nitrogen as ammonium in the Ouseburn over time. Woolsington is upstream of the airport, Airport tributary (Abbotswood Burn) receives runoff from Newcastle Airport and Jesmond Dene is about 10 km downstream from the airport. Closed symbols are annual means of data collected by the National Rivers Authority and Environment Agency; open symbols are means of data collected and analysed by Newcastle University Geography students in October (once also in February) of each year. The lower dashed line is the UK environmental standard for ammonium-N to support “good ecological status”; the upper dashed line is the threshold between “poor” and “bad” status. The “yin” of serious pollution in the Ouseburn has, however, been offset by the “yang” of environmental management as the authorities circled around the problems, gradually learning about the river and using regulation and legislation to tackle the issues. 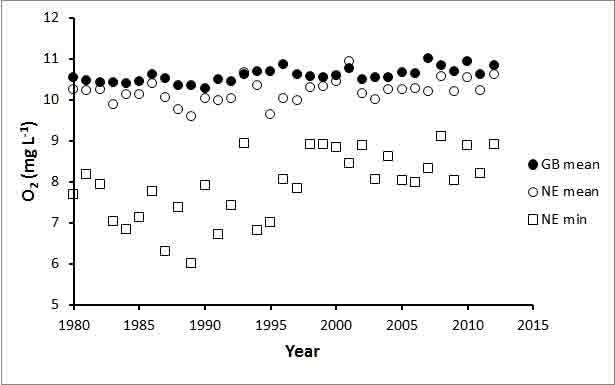 So the graph also shows a rapid decline in ammonia concentrations in the river after 1992 as urea was replaced by a different de-icer, this time based on potassium acetate. Ammonia concentrations are now generally well within the limits required to support good status, so we should have expected to see organisms characteristic of healthy streams to re-appear. It has not happened, alas. As is usually the way, pollution problems are multilayered, like the skins of an onion, and peeling away the first and most obvious problem only reveals further issues lurking below. In the case of the Ouseburn, the switch from urea to (glycol) created a new problem, as microorganisms in the river were able to use this organic compound as a source of energy, sucking vital oxygen out of the water in the process. You can see this in the second graph, which shows biological oxygen demand (BOD). Note how it peaks in the years just after the switch from urea. Note, too, how values fluctuate (dependent, presumably, on the severity of the winter) and, again, how the peaks exceed the current target for “good status”. But, on a positive note, more recent values are much lower, as the airport now has better facilities for handling surface water drainage. 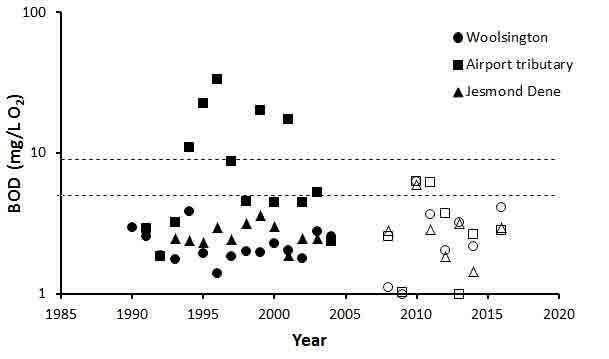 Trends in biological oxygen demand (BOD) in the Ouseburn over time. Details as for the graph showing ammonium-N. Even after this, however, the river is still in a state that is far from acceptable. The final graph in this post shows the state of the invertebrates in the Ouseburn (expressed as average score per taxon). This has gradually crept up over the years but, as can be seen, is still not yet at “good status”. When we empty the contents of our pond nets into trays and take a look, we see lots of pollution-tolerant water hoglouse (Asellus aquaticus) and freshwater shrimp (Gammarus pulex), bloodworms (Chironomous riparius) and leeches. There are very few of the caddis flies, stone flies or may flies that we associate with clean water (with the exception of the relatively tolerant Baetis rhodanii). There are more layers of this onion that still need to be peeled away and I will return to these in a future post. Turnball, D.A. &Bevan, J.R. (1995). The impact of airport de-icing on a river: the case of the Ouseburn, Newcastle upon Tyne. Environmental Pollution 88: 321-332. I found a very useful dataset online that gives a good overview of long-term trends in the condition of British rivers. This is the fruits of the Harmonised Monitoring Scheme (HMS), a programme that has ensured the collection of comparable data from locations all over Great Britain (but not, it seems, from Northern Ireland). The earliest data are from 1980, before the formation of the National Rivers Authority (predecessor to the Environment Agency), when water quality monitoring was the responsibility of ten separate Regional Water Authorities in England and Wales, so collection of comparable data would have required an enormous amount of effort, and this dataset represents a major achievement. I am going to divide my discussion about this dataset across two posts: the first dealing with the good news and the second considering some aspects where the regulators have made some progress but perhaps not enough. I am also going to relate the results from the HMS to the current UK environmental standards for each variable, as these give us a snapshot of what ecologists regard as acceptable concentrations for each pollutant. The precise value of each standard varies depending on the type of river under consideration and, to make life easier, I have used the most lenient of the values for any particular standard. The first variable I looked at was Biochemical Oxygen Demand (BOD) which is a good indicator of the level of organic (i.e. sewage) pollution in a river. This measures the amount of oxygen needed by the various bugs involved in breaking the organic matter down to its constituent parts. As I live in north-east England, I thought that it would be interesting to compare the average values for Great Britain as a whole with the averages for this region. These statistics are, however, not especially illuminating: although there is a downward trend, all values are below the threshold required to support high ecological status. In this case, the “average” is pulled down by the large number of streams in rural areas with low population densities. The maximum values recorded in NE England are, on the other hand, very interesting. 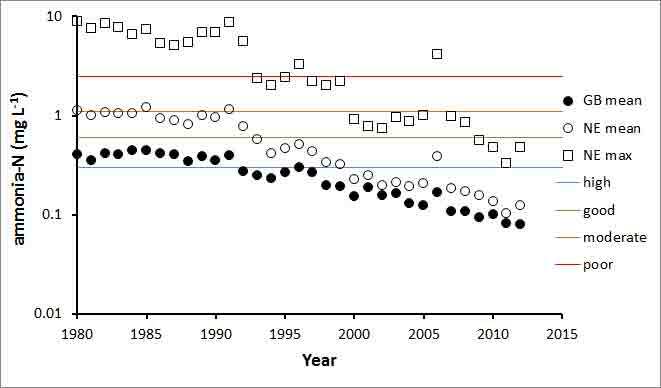 Note the way that values first increase (suggesting a gradual deterioration in water quality), then decrease. And note the point at which this change starts: it is in the late 1980s. The significant date here is 1989, when the then Conservative government split the regulatory functions of the old Water Authorities away from their duties to treat sewage. Previously, the Water Authorities were both “poacher” and “gamekeeper”; from 1989 the National Rivers Authority had no conflicting interests and the effect is visible on this graph. In 1995, the NRA became the Environment Agency, which continues to be responsible in England. The overall impression here is that even the most polluted streams in NE England generally have BOD levels that should be of little concern to ecologists. Trends in average Biochemical Oxygen Demand (BOD) in Great Britain (closed circles) and north-east England (open circles) between 1980 and 2012. The open squares show the maximum values of BOD recorded in NE England during the same period and the horizontal lines show the current UK standards required to support different classes of ecological status. If the bugs responsible for breaking down organic matter in our rivers are not using so much oxygen then there should, in theory, be more in our rivers for fish and other wildlife to use. This is borne out by the evidence, though the trends are not as strong as for BOD. Note that in this case we are most interested in the minimum concentrations available. There are UK standards for dissolved oxygen but these are expressed as percent saturation, rather than concentrations, so we cannot compare the HMS data with these. 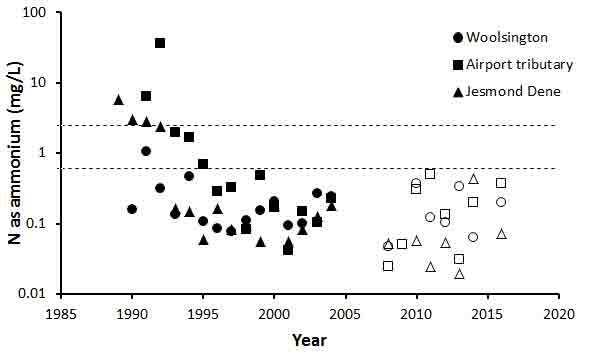 One reason for the weak trend shown here is that the Environment Agency takes monthly “spot” measurements in the rivers it monitors and several factors including time of day can also affect the amount of oxygen present. A river that is visited in on a summer morning will have much lower concentrations of oxygen than one that is scheduled for a visit late in the afternoon of the same day. 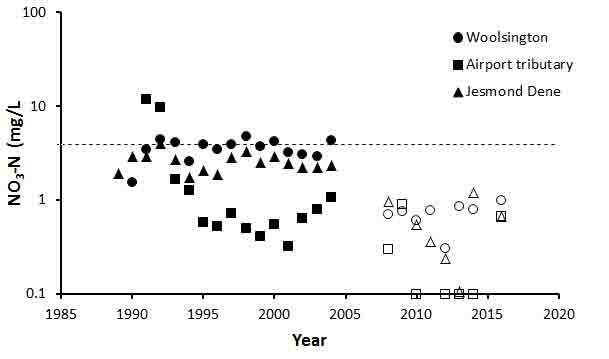 Trends in average dissolved oxygen concentrations in Great Britain and north-east England and minimum values in north-east England, between 1980 and 2012. Legend as for previous graph. Note that UK standards for dissolved oxygen are not expressed as milligrams per litre. Another measurement that gives us a very good indication of the scale of organic pollution in a river is the concentration of ammonium. Proteins are broken down first to urea, which organisms excrete, and then, via the action of microbes, to ammonium. 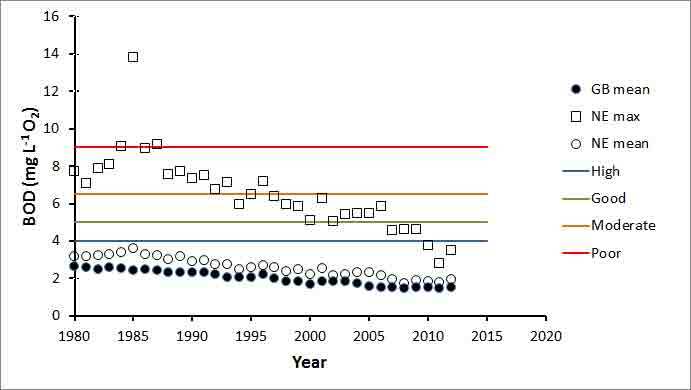 If there is a general trend of better regulation and improved sewage treatment then we would expect a gradual fall in the concentrations of ammonium over the past thirty years and this is, indeed, what we see. As was the case for BOD, ammonia concentrations show a steady downward trend. In this case, the decline only starts after the establishment of the NRA in 1989. Once again, the average state of our rivers looks promising and even the maximum values recorded are now mostly within the standard for “good ecological status”, which is the EU’s threshold for acceptable river conditions. So at the end of the first part of my survey of river conditions everything seems to look promising, with concentrations of some of the main pollutants associated with organic pollution within the limits that should enable the UK to meet targets set by the EU. The Environment Agency has a great deal of experience in managing sewage discharges and the technology for reducing concentrations of pollutants such as ammonium is well understood. In the next post, I’ll move on to consider two other pollutants where the situation is not quite so optimistic and several challenges still remain. Trends in average ammonia-N concentrations in Great Britain (closed circles) and north-east England (open circles), and maximum values in north-east England, between 1980 and 2012. The horizontal lines show the current UK standards required to support different classes of ecological status.